Directory Opus 10.2.0.1 beta is now available for all Opus 10 users. Windows 8 is now officially supported, with the new operating system's retail release. Opus 10.2.0.1 beta fixes an issue on Windows 8 where double-clicking files would only launch Desktop apps, ignoring associated Metro apps. The new Specific Sides tab group option lets you create folder tab groups that open tabs in both the left and right file displays automatically. When in this mode the tab group editor lists left and right tabs separately. The Change Side button ( ) is used to move a tab from left to right or vice versa. The tab bar context menu has a Save Both Sides command which lets you save a specific-sides tab group from the currently open tabs in the Lister. The command Go TABGROUPSAVE=!both can also be used to save a specific-sides group. The Tab Groups page in Preferences now lets you organize your tab groups into folders. The New Folder button ( ) lets you create folders and you can move existing tab groups into a folder using drag and drop. There is also a new Mark as hidden button ( ). When a tab group is marked as hidden it will only appear in the list of groups in Preferences -- it won't be displayed in the group list in the tab bar context menu or in the function editor. In a dual-display Lister you can now link a tab on the left hand side to one on the right. Clicking a linked tab to make it active automatically activates the tab it is linked to. Each set of linked tabs is displayed in a different color and you can configure the colors that are used from the Colors and Fonts page in Preferences. 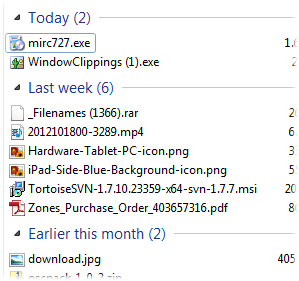 In the above image, the My Documents tab is linked to the Backups tab. You can have up to eight sets of linked tabs per Lister. A linked tab can also be designated as a "slave" tab. In this mode, the slave tab will follow its "master" tab whenever the folder is changed in the master, in a similar manner to Navigation Lock. The difference between slave tabs and Navigation Lock is what happens when the folder you navigate to in the master does not exist in the slave. Whereas Navigation Lock would go "out of sync" at this point, the slave tab will simply change to show the same folder that is shown in the master. From the tab bar, you can link tabs and turn the Slave Tab option on or off using the context menu. You can also define linked tabs in tab groups in conjunction with the new Specific Sides option. The new Go TABLINK command will link the two currently active tabs in the active Lister. Lister Styles previously allowed you to define one or more tabs that would be opened in the left and/or right file display when the style was chosen. This system has been changed and Styles now offer this behavior through the tab group system. Any existing Lister Styles that define tabs will be converted automatically. 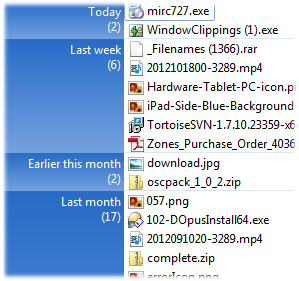 The cosmetic appearance of folder tabs has been improved, particularly when not using visual styles to render the tabs. Added the new Preferences page Folder Tabs / Appearance. This contains the width options which used to be on the Folder Tabs / Options page, the visual style option (which used to be on the Display / Options) page, as well as new options to set a minimum size for tabs and to automatically reduce tab sizes as the number of tabs increases. When multiple tabs are open, the Lister close button closes active tab option causes the Lister window close button to close the currently active tab rather than the whole Lister. The Display new tab button causes a small additional tab to be displayed in each tab bar that, when clicked, opens a new tab showing the specified folder. The Open new tabs next to the active tab option causes new tabs to open to the right of the currently active tab rather than at the end of all currently open tabs. The Show menu when tabs are reduced option will display the popup "overflow" tab menu when tab sizes have been reduced, even if they have not actually flowed off the end of the tab bar. You can now drag a folder tab to the desktop to move it into its own Lister. When clicking on a folder tab the Lister window is now not brought to the front until the button is released, in case you want to drag a tab from an obscured Lister to another one. Middle-click (or double-click, with the Double-click tabs to close them option turned on) on a single tab in a dual display will now close the file display (this is the same behavior as tab close buttons). The background color for "hot" Folder Tabs can now be overridden if desired (Display / Colors and Fonts / Folder tabs). 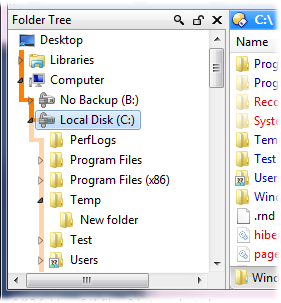 Added the new Folder Tree / Selection Events / Switch to existing tab if already open option. With this enabled, clicking a folder in the folder tree that is already open in a tab will switch to that tab rather than reading the folder into the current tab. The new TABFINDEXISTING argument for the Go command produces the same behavior. The Find-As-You-Type field has a new mode that lets you search all currently open folder tabs. By default the activation key for the Tabs mode is @ but this can be changed from the File Displays / Find-As-You-Type Preferences page. A pop-up list of tabs that match the entered text is displayed, and selecting an item from the list will switch to that tab. The search is performed on both the path open in the tab and, if a title has been set, the title of the tab. The new CLI QUICKTABS command can be used to trigger the FAYT in Tabs mode programmatically. The new Highlight path to selected folder option on the Folder Tree / Appearance Preferences page causes the folder tree to draw a path that marks out the route to the currently selected folder. You can configure the color used for this highlight from the Display / Colors and Fonts page. The Set TREESHOWPATHTOSEL command lets you toggle the path highlight on or off programmatically. The Highlight path to all currently open tabs option will show the path to all tabs rather than just the selected one -- the path for non-active tabs is shown fainter than the path to the selected folder. If you have tabs that are linked, the Use color from tab option will display the path using the color from the tab itself. Finally, the Only highlight paths when tree is active option causes the path to be visible only when the mouse pointer is over the tree, or the tree has input focus. When the file display is grouped, the new Group column provides an alternative to the traditional group headings. When this column is present in a grouped file display, the column itself displays the headings, making for a much more compact display. You can add the Group column manually (or via a command like Set COLUMNSTOGGLE) as desired, or if you want to use the new display style permanently, turn on the Folders / Folder Display / Add 'Group' column automatically when file display is grouped Preferences option. When this option is enabled, the Group column will be added automatically when grouping is turned on and removed again when grouping is disabled. The colors used for the Group column can be configured on the Display / Colors and Fonts page. You can define different colors for source and destination file display if desired. You can also control the maximum width of the Group column with the group_column_maxwidth option on the Miscellaneous / Advanced page in Preferences. In Thumbnails mode, turning the mouse wheel while holding the Control key down lets you adjust the size of the thumbnails. Similarly, in Details or Power mode, Control plus mouse wheel can be used to increase or decrease the size of the text in the file display. You can also use the new Set FONTSCALE command to do the same thing programmatically. The ContextMenu command has been extended to enable it to work with more command types, and to provide workarounds for issues with certain context menu handlers. Context menu items can now also be invoked by their label (as opposed to verb or command ID). Labels can also be matched using wildcards and regular expressions. See the updated documentation for the new ITEMMODE, LOOKUP, WANTSYNC, SHIFT and CTRL, LABEL, WILD and REGEXP arguments. 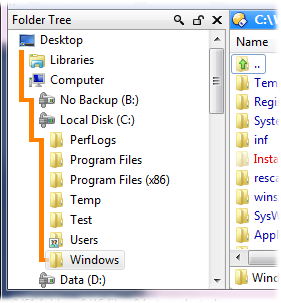 Added an option to the Folder Tree / Contents Preferences page to display the User profile folder at the top of the tree instead of towards the bottom. Added an option to the Duplicate File Finder to number the duplicate groups rather than using the search parameters to describe the groups. Added the ability to configure the color of the toolbar separators and borders (Display / Colors and Fonts / Standard toolbar -- Highlight and Shadow). Added the display_folder_extensions option to the Miscellaneous / Advanced page in Preferences. If this option is enabled folders are treated as having extensions (suffixes) for the purpose of display only (i.e. in the Name and Extension columns). Added the keepext argument to the FileType NEW FROMCLIPBOARD function. The filter at the bottom of the Customise / Keys page now lets you switch it to searching the names and functions of hotkeys rather than the keys themselves. Added the Full path column which displays the full path and filename. If this column is used with the Print Folder function you are able to turn off the file name column (which is normally not allowed). /ArgsMsgBox displays any remaining arguments in a message box. /ArgsToClip puts any remaining arguments into the clipboard. The Preferences / Colors and Fonts page now remembers which item was last selected the next time you open the page. The Rename command has a new NOMATCHNOFAIL argument. When used in a multi-line function, files that do not match the rename pattern are still passed to the subsequent commands instead of being skipped. Modified the way the Help function works with non-English languages (specifically German). Previously, if a help file matching the current language was installed it would always be used in preference to the English one. Instead, the English help is now always used by default (e.g. F1 in the Lister, or F1 context help in Preferences). The Help drop-down menu will now display a separate help command (e.g. Hilfe (Deutsch)) that opens the non-English help file. The Help command has a new LANG argument to support this. MP3 Release time was incorrectly adjusted for the current timezone when displaying the date (but not when setting it, so a side effect was depending on your local timezone it could appear as if the date was set to one day previous to the one specified). Extracting a coverart image from an MP3 file via the metapane would save it as a PNG even if you selected to save it as a JPEG. Fixed a problem with the third-party Link Shell Extension, where it would add the wrong items to the drag & drop menu if shift was held down. Context menus triggered via the keyboard no longer highlight the menu item under the mouse if the mouse happens to be over them when they open. Fixed crash with Select SIMILARBASE command and a huge number of filenames. It's now possible to run the Find command programmatically multiple times from the one function. Fixed bug where deleting a folder that was open in a locked tab would cause a new tab containing the folder's parent to be opened. Fixed crash caused when deleting a folder that's currently open in a locked tab. Fixed a problem with folder tabs where control+drag to duplicate a tab did not work if the tab was locked and its path had been modified. Fixed Text-File Thumbnails plugin crash with files ending with specific characters. Fixed crash caused when third-party column provider shell extensions failed to initialize. Fixed a crash that could occur with label filters that referred to column providers (e.g. Tortoise SVN) if those columns were also displayed in the Lister. Fixed problem with editing of label filters not cancelling properly. Opening folders via Explorer Replacement mode now respects the 'Open external folders in new tab' option in all cases. Previously there were a couple of methods that would ignore this option (e.g. opening a folder from the Previous Versions properties dialog). The default path field in the 'Create Self-Extracting Archive' dialog now scrolls if you type a path longer than the visible width. The folder tab scroll buttons (if enabled instead of the pop-up menu) now respond to double-clicks as well as single-clicks. i.e. You can scroll by quickly clicking on the button without having every second click ignored. If you group by Disc Number, the groups are now sorted numerically instead of alphabetically (9 comes before 10). The metadata panel is now more resilient to bogus or missing ContentType data in the registry. Fixed crash in Find Filter editor when editing Shell Column filters, if a blacklisted shell column handler was installed. Fixed Ctrl-Shift-Right in the Find-As-You-Type field only selecting the first path component in certain situations. Property Handler shell extensions are now ignored when saving tags to MP3 files, as they should not be needed and have caused problems in the past due to handlers that claim to have successfully saved tags which they did not. Opus will no longer display (or overwrite) iTunes COMM fields in MP3 files. Styles which turned on the Format Lock only affected the left file display(s). If you run the "Find" command without specifying a path, and without any folders selected, such that it opens the Find panel for the current path (or opens a new lister with the Find panel for the lister's default path), then the Folder Lock is no longer initially disabled. In the Find dialog, the Folder Lock is now visibly disabled when the search path is in a fixed state (which happens when the panel is opened via the "Find" command instead of the "Set UTILITY" command.). Also, the Folder Lock becomes enabled and effective if the path list is reset after being in that state. Fixed crash which could occur if, starting with one tab, you opened two extra tabs, then closed them in the reverse order. If a filetype's FriendlyTypeName points to a DLL/resource which does not exist, we now ignore it and fall back on the non-localized name (if any) or generic "XYZ File" string, as Explorer does. In the standalone viewer, when launched via D8Viewer.exe and with automatic image rotation via EXIF enabled, rotation was applied to the file you double-clicked but not to other files in the same directory if you moved to them with the next/prev actions. Fixed buttons which run SetAttr META (or Set DESCRIPTION) followed by other commands, not running the other commands for files that do not need changing. For example, if you had a button which cleared the file description and then renamed a file, it would not rename files which already had cleared file descriptions. A queued Copy AS / Move AS operation from a plugin archive (e.g. RAR) now works correctly. Fixed an issue with locked tabs where when clicking away from a locked tab that had changed its folder, the tree would not correctly sync to the newly selected tab. Fixed an issue with locked tabs where clicking away from a locked tab, on the right side of a dual display Lister, that had changed its folder, could cause the focus to be incorrectly given to the left file display.